‘Vergic Automation Tools’ is a set of components that will increase the quality and efficiency of your service agents and reduce the effort for your digital customers. It’s like your agents had a virtual assistant by their side. Vergic Automation tools together with complementary APIs will give you an easy way to get even more functionality out of the Vergic Engage platform. Vergic Automation Tools can be used to automate parts or the whole dialogs you have with your customers on digital channels. With the automation tools a human service agent can be assisted when he/she is handling simple and repetitive tasks leading to reduced handling time and a better co-worker experience. Our automation tools will also make it easier for the human service agents to focus on the more advanced tasks and dialogues and if needed support them with process automation. The tool is also supporting virtual agents, AI and machine learning. There is a rich box of tools to enhance an agent’s everyday tasks and quality. The toolbox is a set of component that can run robotic process with and without cognitive support. The toolbox can define and execute processes such as co-browse a web site, login visitors and or perform transactions on behalf of the visitors. The toolbox can maintain process and control steps when collaborating with back end systems such as CRM systems, order management systems or similar. In the toolbox, there is built in support for AI and you can use NLU and chatbots to support your customers. 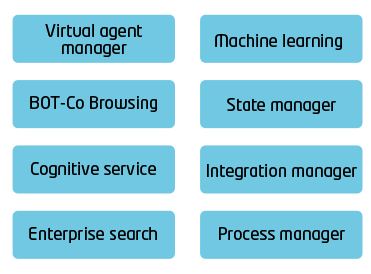 Vergic Engage automation tools have an open API and several world leading AI and machine learning vendors are already partnered up and using the APIs. For specialist AI and BOT vendors Vergic’s APIs for AI have been included in the toolbox. The Vergic Engage Automation toolbox fully supports the “bring your own” app concept. Vergic Automation tool allow internal and external components to work together. Enabling AI/BOTs to pick up meta data and perform co-browsing with very little effort. The tools also allow customers to utilize their already produced web content, FAQ and Knowledge bases in a completely new and innovative way. Vergic Automation tools allow AI, Knowledge Bases and CRM systems to support agents in real time as they process incoming support cases. In the video above you will see an agent assisting tool that listens in to a dialog and suggest proper response that is retrieved from a external knowledge base. Example of an automated assistance workflow. In the image above you see a service agent that hands over the dialog to a Bot to handle a common “Register/Sign up”- workflow. While the Bot handles the registration the agent can focus on other dialogs. Once the workflow is complete the customer is transferred back to the live agent. Vergic Automation tools contain a computing platform, built in or external AI/bot services can execute and run inside the safe and stable environment of the Vergic Engage platform. The toolbox support token based security models and can be used together with Vergic Engage APIs and connectors for many of the worlds market leading contact center software.